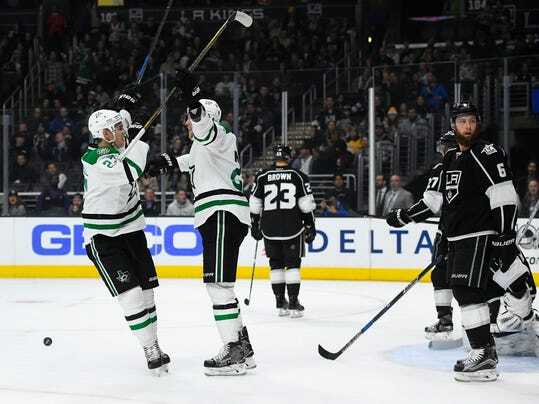 LOS ANGELES (AP) — After the Stars and Kings exchanged seven goals in a frenetic 13-minute span, both coaches felt compelled to yank their starting goalies in the third period of a one-goal game. Dallas hung on to put a solid finish on a wacky Monday night at Staples Center. Jiri Hudler scored the tiebreaking goal with 12:16 to play, and the Stars blew a late two-goal lead before hanging on for a 6-4 victory over Los Angeles. Patrick Sharp had an empty-net goal and two assists, while Hudler, Tyler Seguin and Devin Shore had a goal and an assist apiece against the Kings, usually one of the Western Conference’s best defensive teams.